The solemnization of Marriage Act requires that you obtain a marriage licence before getting married in Prince Edward Island. The licence does not mean that you are married, but that you may get married. A marriage licence is valid for three months from the date of issue. Applications for a marriage licence can be completed at some Access PEI sites. However, the Charlottetown and Montague Access PEI sites do not offer this service. Appointments should be made in advance. Applicants must make an appointment with the Vital Statistics office or any of the Access PEI sites listed below. The marriage licence will be issued at the same time the application is processed, providing both applicants are present and have all the required documents with them. The fee for the marriage licence is $100.00 payable by debit or credit card when the license is issued. This amount is non-refundable. Divorced persons must produce the original copy of their Certificate of Divorce with seal. Widowed persons must provide a Death Certificate issued by Vital Statistics from province in which the event occurred. Couples must provide the date and place of marriage and the name of the person performing the wedding ceremony. 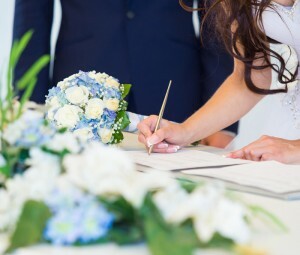 For civil or religious ceremonies the officiant must be registered with Vital Statistics.